← Has the Tata Nano killed the city? As a European, muscle cars are something that have often eluded me. Sure, I understood why people would buy them, but I had no idea why I should buy one. Driving one does feels like an occasion. Turn them on, and the old V8 growls awake. Then you have the straight-line performance, which is often pretty good. Cornering though is often an issue. I always thought myself more of a Mustang man. Boss 302 for me, please. However, just like many Europeans, it would remain at the dream stage for me. Owning a muscle car in Europe is like owning a cheetah with a taste for human flesh, it just would not happen. 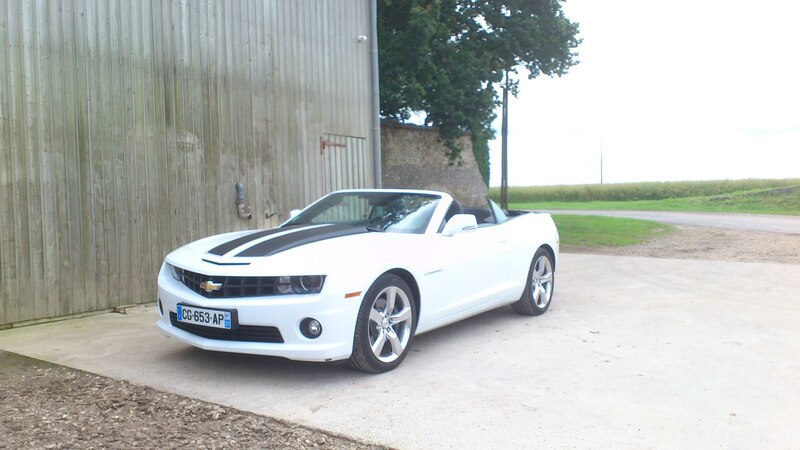 Then one day, I was invited to drive a European version of the 2012 Chevrolet Camaro Convertible. It was a white one with go-faster black stripes (retailing for a meager €1,200). Under the hood was a powerful 6.2L V8 doing about 420bhp. Seemed like a lot, until I remembered the Germans can get that power from a V6, and the Japanese from a 4-banger. The great point about this Camaro was that it had a manual gearbox. This way, you actually felt that you were in control, trying to wrestle with the huge engine. From the outside, the whole thing was very American. The car was very wide, high, big, a pantomime of a car really. The wheels may have been 21 inches, they looked of average size on it. Outside, it is all sharp edges, making the car look cool and retro, but it does feel slightly over the top. Inside, the driver is greeted with cheap plastics and retro counters. It looked good, but did not feel right for the price tag. Once installed though, the driving position was very good. You had great overall vision (it is a convertible after all), and the seats were comfortable (it is American after all). Inside, it does feel fairly small, however, considering the size of the beast This is partly due to the big centre console, upon which sits the gear lever, and an awkwardly placed handbrake. Everything felt in its proper place. Turn the ignition on, and that familiar V8 growl greets you, albeit slightly muffled. Not as good as what Mercedes can do with a 6.2L V8 thoug h.
Now this was my first time driving such a car, and I was a bit scared. Would the car spin hopelessly when I touched the accelerator pedal? Would I crash into my nearby parked Golf? Luckily none of these happened. The clutch was not hard to operate, and the car just moved forward, with no hassle. The gearbox may have been a bit stiff, but once you got used to it, it actually felt very good. On the open road though, I got an epiphany. Mash the throttle, and the car howls with pleasure. It leaps forward, and you are greeted by the great sound. Your senses come alive and you get a small adrenaline rush. It may be a very wide car, but because of the good visibility, it is very easy to place on the road. I had no fear at all with on-coming traffic. The Camaro may be 1.92 meters wide, it was very easy to drive. Then came the bigger shock when I faced my first corner. I turned the wheel, and the car obeyed with no hesitation, the steering was precise and direct, perfectly weighted. It may not offer the driving feel of a Porsche 911, but it is still very good, considering what we knew about old muscle cars. It did not feel like an American movie car, where you steer in a straight line. Here, you turn, and the car immediately reacts. Dare I say it? It handled like a European car! No hassle, no body roll, just simple precise movements. They even got the damping spot on, not too firm, but it allowed you to feel the road. Don’t get me wrong, it was no Elise, but for the size, it was very good. I would go on to say it was as good as the C63 AMG I drove. What a joy it was to fling these near two tons of American muscle through windy European roads. I was in love. And because you do not see this type of car everyday in Europe, people smile and wave at you. In this car you look like a fun guy with some imagination, in the equivalent Audi, you look like a pretentious douche. The only slight disappointment I got was with the engine. I always imagined these old American V8s were torque monsters, which could burn rubber by simply looking at the gas pedal. With this one though, it felt a bit weak below 3,000rpm. After that, you felt the power, but below, it just lacked grunt. Mash your foot down at 2,000rpm and there would be some lag before the car decides to properly go. Thinking of it, it felt like a sporty European engine, where you have to rev it to get the best power. Could it be that this is actually a European car in disguise? This being a muscle car also, what better way to unwind after all this excitement, than to disconnect the traction control and do a bit of hooning, via some good old fashioned elevenses. It was a little disappointment then, however, as when you mash your foot down, and lift off the clutch, the ensuring burnout was relatively small. More sound, power and torque was needed methinks, and I can only hope to drive the new LS1 version then. This drive has converted me. That combination of European handling and American muscle is perfectly balanced, it is weird the Mustang is not like that, given Ford’s European links. 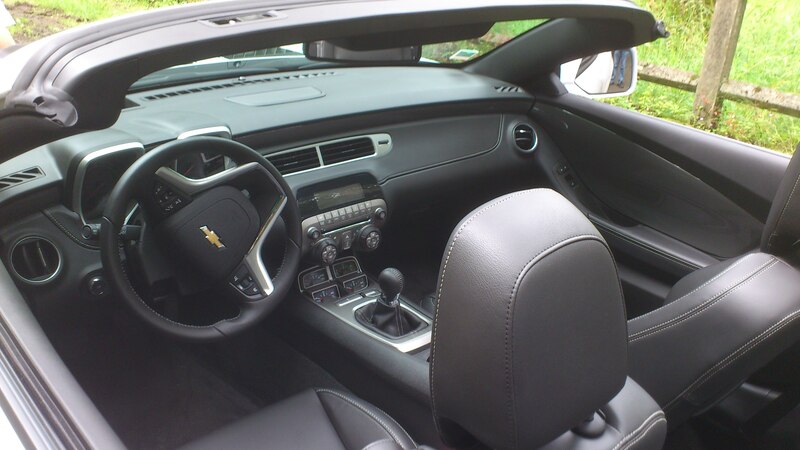 Screw the Mustang, my muscle car of choice is now the Camaro, in convertible form, to enjoy that glorious sound. Unless I get my hands on a Cadillac CTS-V. The only problem I could see with owning a Camaro in Europe is the fuel consumption. After a day of hooning, I managed 10 miles per gallon, which is very, very expensive in the long run. However, given the amount of fun you can have, and the smiles you get, it is worth it. And taken into account the price per horsepower, it is actually a great bargain! This entry was posted in Car reviews and tagged amg, camaro, car, chevrolet, convertible, hooning, mercedes, mucle, mustang. Bookmark the permalink.